The International Monetary Fund (IMF) has joined criticism of Donald Trump’s plan to impose a 25% tariff on steel imports and 10% on aluminium. The body warned that such a move would hurt the US as well as other countries. It said others could follow the US president’s precedent by claiming tough trade restrictions were needed to defend national security. 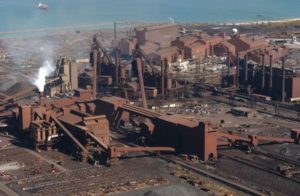 Canada, the largest supplier of steel to the US, said tariffs would cause disruption on both sides of the border. Why are the tariffs bad news? Unless you are a US steel producer or have a livelihood dependent on one then chances are you will lose out. So why is Trump doing this? He pledged to support US business interests against cheap imports, and he is now intent on honouring that pledge. And if imports continue, his treasury coffers will be a little higher too. But mostly it’s about “rust belt” jobs, and because steel production in the U.S. fell by 11% between 2014 and 2016, while demand has been increasing. Is this normal in capitalism? The interesting thing about import tariffs is that they run counter to free market economics. Adam Smith understood this centuries ago. Wealth is created when governments don’t restrict free trade. Scott Drenkard explains this better than I can. So while we might think capitalism and free market economics go hand in hand, and I hate using the following phrase; it’s more complex than that. Free market economics has in recent years been absorbed into what we now call neoliberalism. This cluster of policies also includes free movement of people, low levels of regulation and the disposal of state assets. Capitalism agrees with the last of these, but it appears to be an outdated term now that its antithesis, communism, has largely disappeared from world economics. So yes, it is normal in capitalism, because governments look after their own. Or so they think. But tariffs are counter to neoliberalism as esposed by the EU’s Single Market, the IMF and even the WTO, to which countries agreed reduced tariffs through their efforts. In fact the nations that impose trade barriers are the worst affected by them. In the UK, it’s hard to find a right wing think tank, or indeed any think tank, that supports what Trump is doing. My thoughts are totally in line with everything else I have read which is critical of raising tariffs. Neoliberalism might be a dying trend in world politics, and some can quote the damage its done and be happy it’s on the way out. But replacing neoliberalism with protectionist capitalism turns the clock back to the days before the WTO banged heads together and had heads of state agreeing to a common list of tariffs. If, as is likely, other countries will retaliate by imposing their own tariffs on US products then that would make things worse still, despite feeling pleased not to let Trump get away with it. It would eventually lead to a kind of economic mutually assured destruction. Hopefully Trump will pull back from imposing the tariffs. But something tells me he will go ahead.